Instructional coaching or mentoring, as a form of professional development for teachers, has gained importance as educational policy has called for the implementation of research-validated instructional practices by highly qualified teachers. Technology-mediated mentoring has strong potential for overcoming barriers of accessibility and cost-effectiveness associated with traditional on-site mentoring. The purpose of this article is to synthesize existing peer-reviewed empirical studies on technology-mediated mentoring for inservice teachers. Three mediums for technology-based mentoring were explored: technology-enhanced professional development coupled with access to a mentor, electronic mail, and online discussion forums. The synthesized studies primarily incorporated mixed-methodologies or were qualitative. Results suggest that, although usage of some technology-based mentoring implementations was low or variable, those who accessed the resources generally reported having a positive experience, reporting shifts in their attitudes towards instruction and changes in instructional practices; however, few studies substantiated teacher self-reported improvement in knowledge and practice through direct observation. While existing research is both informative and encouraging, more rigorous qualitative and quantitative research, particularly quasi-experimental and experimental studies, is needed. As no located studies addressed the impact of the technology-based mentoring of teachers on the outcomes of students, particular attention should be paid to this significant outcome variable in future research. Gentry, L.B., Denton, C.A. & Kurz, T. (2008). Technologically-Based Mentoring Provided to Teachers: A Synthesis of the Literature. 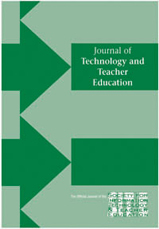 Journal of Technology and Teacher Education, 16 (3), 339-373. Waynesville, NC USA: Society for Information Technology & Teacher Education. Retrieved April 25, 2019 from https://www.learntechlib.org/primary/p/24347/. Annenberg Institute for School Reform (2004). Instructional coaching: Professional developments trategies that improve instruction. Providence , RI : Brown University. Egan, G. (2002). The skilled helper: A prob lem-managemen t and oppor tu n i ty-deve lopmen t approach to helping (7th ed.). Boston: Thompson/ Wadsworth. Hawkes, M. (2001). Variables of interest in exploring the reflective outcomes of ne twork-based communication. Journal of Research on Computing in Education, 33 (3), 299-315. Idol , L. (1992). The special educa tor’s consultation handbook. Austin, TX: Pro-Ed.